For all emergencies, dial 911. For non-emergency police matters, please dial 720-898-6900. In Arvada, we believe that community safety is directly tied to citizen involvement. Sector policing enables Arvada's police officers to become experts on the needs, issues, and concerns of the people within the specific areas, or sectors, to which they are assigned. 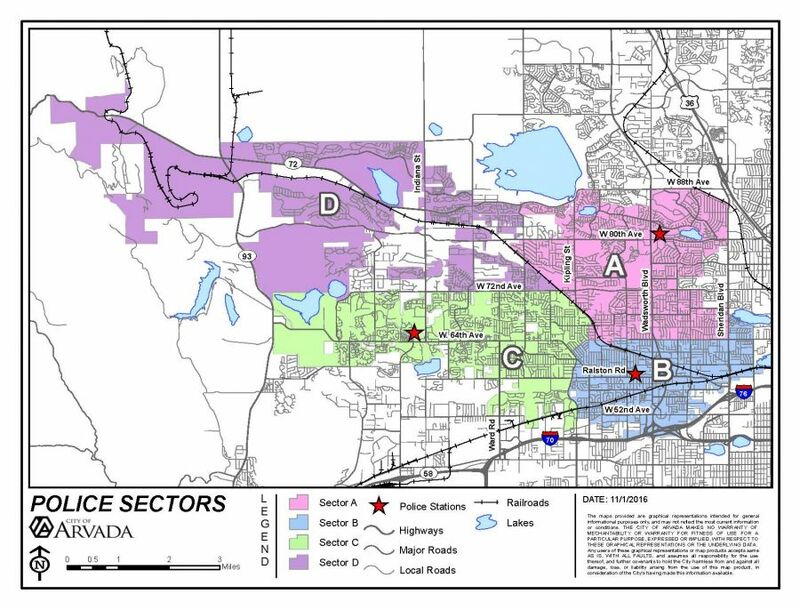 Arvada has four current sectors--Adam, Baker, Charlie and Delta -- that have teams composed of one Commander, Sergeants, Detectives, and numerous officers including School Resource Officers. While much of the day-to-day policing decisions and resource allocations are made at the sector level by sector command staff, police operations throughout the City are overseen by the Chief of Police, Deputy Chief of Operations, and Deputy Chief of Patrol. Sector Policing emphasizes citizen interaction and participation in problem solving. Citizens get to know the officers who are responsible for patrolling their sectors, and the officers get to know them. Success is determined just as much by citizens as by changes in crime statistics.